Tanzanian musician Diamond Platnumz and model Hamisa Mobetto. 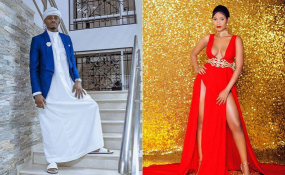 Bongo flava star Diamond Platnumz has lashed out at his baby mama Hamisa Mobetto over claims she has been using witchcraft to lure him into marriage. Tanzanian social media platforms have been awash with audio clips claimed to be secret recordings of Hamisa consulting a witch doctor. In the recordings, a woman is heard beseeching the alleged witch doctor to help her have control over Diamond so that he can comply with all her desires. Further, tells the witch doctor that she wants Diamond's mother Sandra, and his elder sister Esma Platnumz, who are not fond of her, dealt with as they appear to be an obstacle to her ambitions. The authenticity of the recordings is in doubt, with many accusing Diamond's family of sponsoring the recording in order to ruin the relationship between the singer and the video vixen. Shockingly, Diamond has come out to defend his sister and mother against such accusations. In an interview with Wasafi TV, the singer confirmed to have listened to the recordings carefully and is satisfied beyond doubt that the woman's voice is that of Hamisa. "Unapotaka kwenda kwa mganga uniroge mimi, na mamangu na familia yangu, unaonekana wewe haushindwi kumuua hata mamangu kama unawaza eti mimi nikupe nyumba sijui nikupe nini. Voice note zinatambaa tambaa, mimi pia nilitumiwa hiyo voice note. Ninazo halafu unajua unasikia kitu ambacho unajua huyu ni yeye," Diamond states in the interview. He further revealed how he confronted Hamisa with the voice recordings. "Halafu nikamwambia 'huyu ni wewe'... Halafu mara kumi uniroge katika kazi zako sio utake kuniroga mimi eti nikuoe. Why do you wanna do that?" "So kuna vitu watu wanaongea ongeaa, halafu wanajaribu kuvipindisha aonekane mamangu na dadangu ndio wana matatizo. Mamangu na dadangu hawezi kuwa na matatizo. Halafu hao watu wako unaowatuma wakatukane, nishawahi kuona ukiwatuma wakatukane kwa watu wengine. Kwa sababu uliwatuma pia wamtukane Zamaradi. Unachokifanya sio kizuri"
The audio clips are said to have leaked just weeks after Hamisa revealed that she had turned down so many marriage proposal as she wait on the singer to ask her hand in marriage. #bongo5updates Msanii wa muziki Diamond Platnumz amefunguka kuzungumzia sakata la kutaka kulogwa na mzazi mwenzake Hamisa Mobetto ikiwa ni siku chache toka audio inayodaiwa kuwa ya mrembo huyo isambae mtandaoni akisikika kuzungumza na mtu anayeadaiwa kuwa ni mganga kuhusu familia ya rais huyo wa WCB.